We, as we know that incense sticks are burnt to spread harmony, to purify and cleanse the air of unwanted odours. Particularly, this Musk incense sticks comes up with an effect to solace to the weary and stimulated ming and senses. Well god has gifted us the sense of smell to all of us, hence the choice and pleasure is ours. One common fact about these incense sticks is that it does not enhance the physical well being of the human body however it surly increases the positive energy of the body. 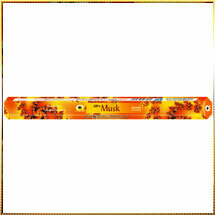 These Musk incense sticks are generally used to induce relaxation within individuals. And this state of relaxation is absolutely important for individuals who believe in meditation.